Print design for British Heart Foundation. 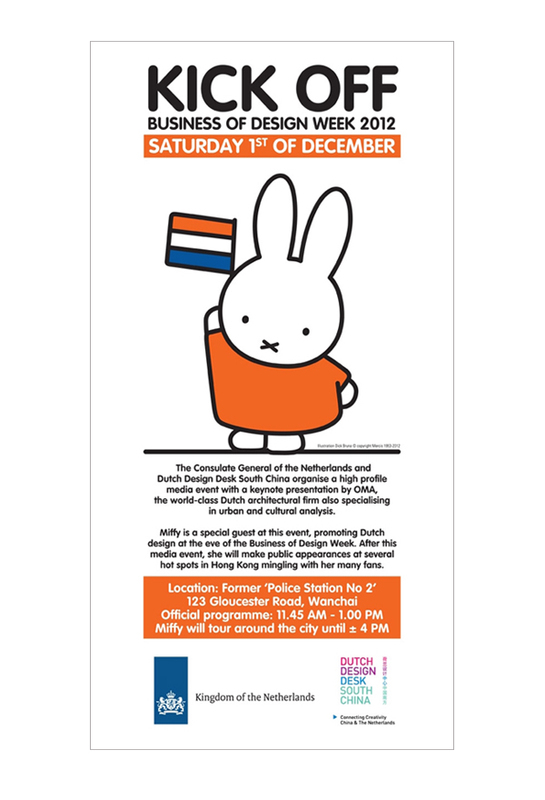 Assisting Dutch Design Desk South China (DDDSC) in social media and graphic design to raise the public awareness and interest in Dutch design among Hong Kong and South China region during the event of Business of Design Week (BoDW) in Hong Kong [ From 5 December to 8 December 2012 ]. The Dutch Design Desk South China was present at Hong Kong Business of Design Week 2012 as a linking pin between the attending Dutch designers and Chinese companies. The Desk had a pop-up space at the Dutch Design on the Move exhibition in the Inspiration Hall of Business of Design Week and hosed network events and excursions together with the Dutch consulate in Hong Kong. 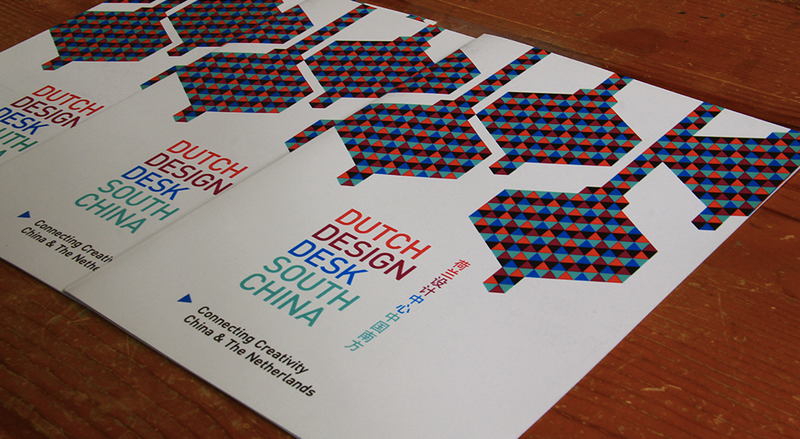 Dutch Design Desk South China also offered matchmaking services to Dutch designers. ◆ 1. Planning and executing online and offline event activity of "Holland Branding" during Business of Design Week , alongside the Netherlands Consulate General in HK & Premsela. ◆ 2. Designing company's promotional collaterals. ◆ 3. Updating DDDSC's Website Content Management System [CMS]. The project Dutch Design Desk South China (2011-2012) was part of a fixed term strategic programme by the Dutch government (2009-2012) aimed at strengthening the international position of Dutch design, fashion, and architecture, by building long-lasting international partnerships and focusing on topical issues and local demand. 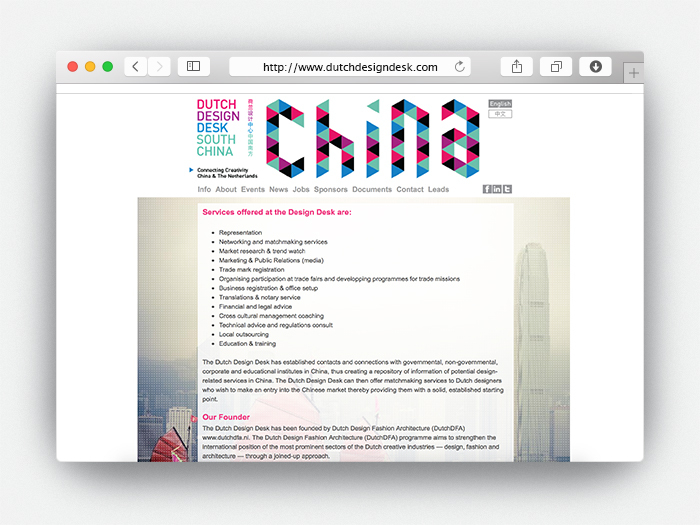 The Dutch Design Desk South China (DDDSC) operating from Hong Kong was launched in May 2012 under the directorship of Marielle Lagers. This was a follow-up to the Dutch Design Desk Greater Pearl River Delta in Guangzhou. 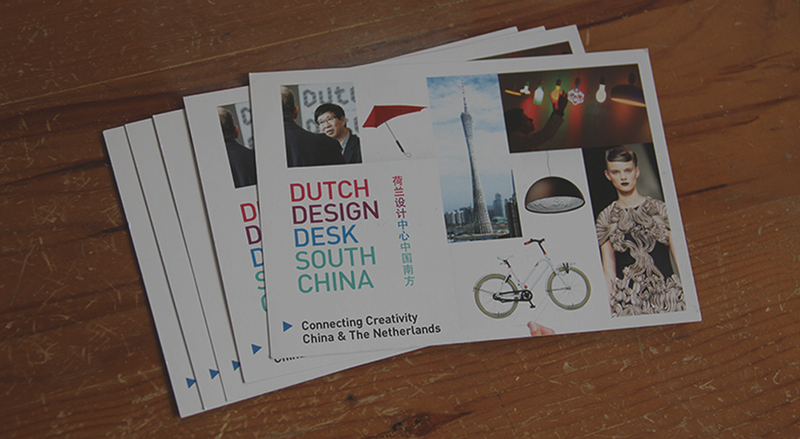 DDDSC served as a regional hub and linking pin for Dutch players in the field of design, fashion and architecture, and supported individual designers with their initial steps in this challenging environment, with services such as local marketing and promotion, matchmaking and practical advice. 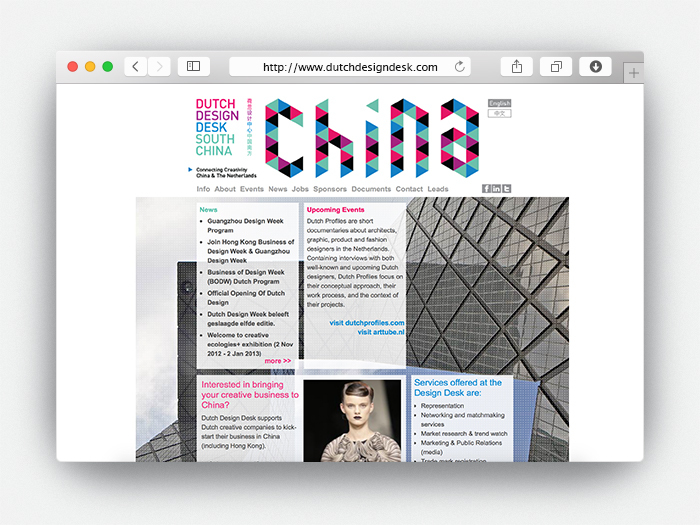 On slide 13/35, Connecting the Dots magazine featured Dutch Design Desk South China on an article — "Bird's Eye View On China". Connecting the Dots Magazine: Publishing and presenting Dutch designers and design-culture internationally during key design events and fairs. 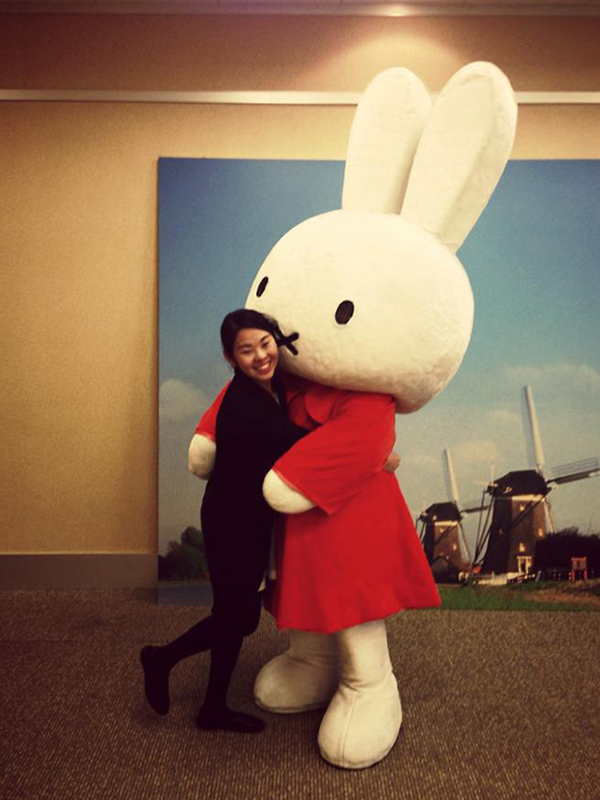 This edition was made for the Business of Design Week in Hong Kong and the Guangzhou Design Week 2012. Sharing & documenting CS experience.